An incomplete Post Medieval copper alloy dress hook of probable c. AD 1600-1700 date. The hook has a rectangular plate and flat in cross section. There is a rectangular attachment perforation at one end of the plate and the remains of the hook shank at the other. The hook has been broken away by an old break. The front surface has been decorated with moulded foliate designs. The reverse is undecorated. 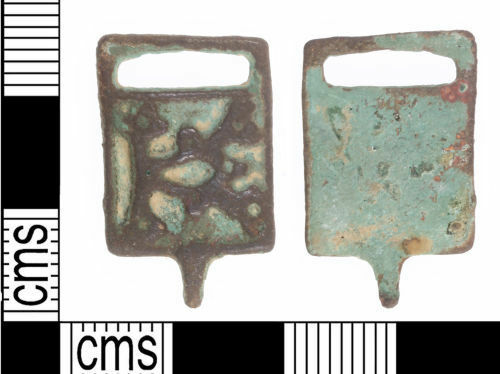 No parallels for this decoration have been found but dress hooks with rectangular plates are normally dated to the early Post Medieval period. The dress hook is 25.4mm long, 15.5mm wide, 1.5mm thick and weighs 2.46 grams.